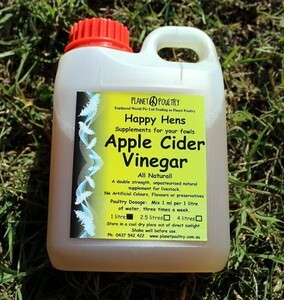 While the efficacy of Apple Cider Vinegar in ruminants as a tonic has not been extensively studied, research into its use with poultry has revealed definitive health benefits. The apple cider causes an alkaline effect in the animal which reduces the likelihood of illness and helps fight existing maladies by helping to support the immune system. 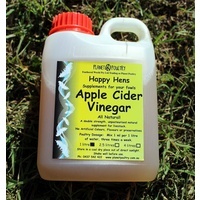 Apple Cider Vinegar is full of vitamins, minerals and trace elements. It helps to lower the pH level in the stomach, helping digestion and making it a less friendly for harmful pathogens. Specialist poultry researchers at the University of Arkansas have run trials on the use of products like ACV in the water of broiler (chickens raised for meat) production systems, to reduce pH levels. Previous research has shown that if the pH of the crop (basically the first part of the chicken's stomach) was lowered close to a pH of 4 (acid), it creates an environment that was inhospitable to undesirable microbes, particularly nasty bacterias. It is unpasteurised, therefore retaining the mother of vinegar which is vital in preserving all vitamins and minerals. It has powerful healing, cleansing, natural antibiotic & antiseptic qualities. It has both internal and external benefits for Itch, Bot Flies, Fleas, Ticks, Skin Conditions, Arthritis, Mastitis, Cystitis and endless ailments. It is an excellent cleaning product. Suggested Poultry Dosage: POULTRY 5ml per litre of water 2 or 3 times a week. No preservatives or additives - Completely natural! !